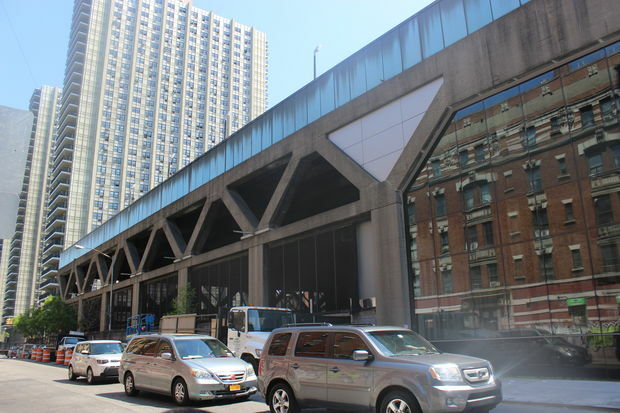 WASHINGTON HEIGHTS — The long-awaited George Washington Bridge Bus Terminal opened to much fanfare earlier this week, but much of the three-story space remains vacant — with questions surrounding the status of big-name tenants once expected to anchor the space. An official map of the main terminal — or "west terminal," which stretches from Fort Washington Avenue to Broadway between 178th and 179th streets, and "east terminal," which stretches from Broadway to Wadsworth Avenue between 178th and 179th streets — features stores, bathrooms, escalators and other sites of interest. None of the stores are identified by name, which developers George Washington Bridge Development Venture LLC told DNAinfo New York is because the list of stores is still "preliminary." But according to a list of stores developers provided to DNAinfo, big-name chains like Marshalls, Gap and Blink Fitness are still on deck for the space while Buffalo Wild Wings, which had earlier been touted by developers, is no longer connected to the project. Reps for Buffalo Wild Wings did not immediately respond to calls for comment and developers did not say why Buffalo Wild Wings parted ways. Sources said that businesses have pulled out of the project and additional businesses who inked leases with the terminal may still drop out due to construction headaches and frustrations with the Port Authority and the developer. Years of delays and red tape dogged the project and developers most recently told small businesses they would have to wait until union contractors were done working at the terminal before they could begin work with their own non-union contractors. The first floor, which is currently closed to the public, will eventually include a cluster of small businesses, all of which have yet to break ground. It also includes an entrance passageway to the A train that has yet to open to the public. ►Marshalls entrance — The discount department store's first-floor entrance will stretch along the main entrance of the terminal on Broadway to 179 street, according to the map. Escalators inside the store will lead up to the second floor. Reps for Marshalls declined to comment on the site. ► GAP Factory outlet — The outlet store for GAP will be located on the first and second floors. ► Fine Fare Fresh — The grocery store is expected to take up most of the first floor, according to the map. ► Pick & Eat 3 — This is the third Uptown location for the restaurant, popular for its natural and fresh menu, including vegan and gluten-free options. ► Lulu & Angies Pastries— This will be the first location for the bakery, which is owned by the team behind the GWB Juice Bar opening on the second floor. ► Gateway News — The candy and newsstand retailer is slated to open on the first floor, according to the map. ► Café Buunni — This cafe, which also has an outpost at 213 Pinehurst Ave., at 187th Street, will take up space on both the first and second floors of the terminal's west building. The coffee bar also features smoothies, espresso and baked goods. ► Spectrum — A Time Warner Cable location will be inside the first floor. Locals had complained that the nearest site was on 96th Street. ►Cobbler & Shine — a shoeshine store. ► Credit City — information on this retailer was not immediately available. ► VistaCare — information on the retailer was not immediately available. ► RCBS Media — information on the retailer was not immediately available. ►Citibank- The banking chain will open a location inside the terminal. ►PNC bank - The banking chain will open a location inside the terminal. ► Marshalls — It will take up the majority of the second-floor space. ► VSBerry Ice Cream — The ice cream shop, which sells 12 flavors of soft serve and an array of 100 toppings, has locations at 4971 Broadway at Isham Street and 4996 Broadway at 212th Street. It is owned by Salma Lopez and Victor Sidberry, who also operate Yummy Thai restaurant in Inwood. ► Nail Lounge — This shop, which has a site at the corner of Dyckman Street and Broadway, describes itself as the "premiere nail salon in New York City." Prices range from $10 for a basic manicure to $80 for gel extensions. ► Joyeria Pepe Jewelry — The jeweler currently has three nearby locations, according to its website. These include 4162 Broadway at 176th Street, 1403 St. Nicholas Ave. near 180th street, and 1324 St. Nicholas Ave. between 176th and 177th streets. ► De Los Reyes Optical — The optometry shop will test vision and sell eyeglasses and contacts. ► GWB Juice Bar — The store, which is the first for the owners, is dubbing itself as an "exciting new juice bar" that's bringing Washington Heights a savory, organic and healthy smoothies, desserts and fresh-squeezed juices with a co-branding deal with Nathan's Hot Dogs. ► Gateway News — The candy and newsstand retailer will also have an outpost on the second floor, according to officials. ►Greg the Iconic Look — Information on this retailer was not immediately available. ► Café 178th Street — Information on this retailer was not immediately available. ►A Mr. Nice Guy — Information on this retailer was not immediately available. ► Escalator to the third-floor bus terminal area. ► Bus Lanes - There are 21 bus lanes that had been in use prior to the opening of the terminal. ► Bus-ticketing area — This area features ticketing machines and clerks selling tickets, which will now be required before boarding. 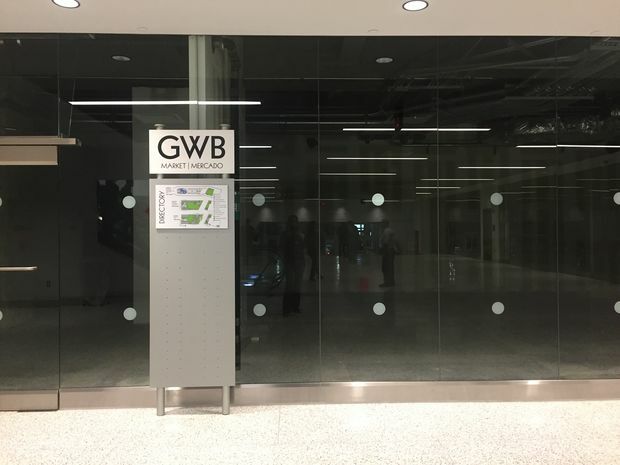 ► Blink Fitness — The gym will open in the section of the third floor terminal between Broadway and Wadsworth Avenue, Port Authority officials said Wednesday.